My ancestors have been working in France since the 19th century as hunting dogs. Even though my breed is the smallest of the gun dogs, I am competent, capable and versatile. I am just as good at being a household guard as I am at pointing and retrieving, so I make a fine pet for the family of a businessman who is a weekend hunter and outdoor-type. I wouldn't like it much in an apartment, though, unless you can take me out to run and play every day, because I require daily exercise to stay fit and healthy. When fully grown, I am between 15.5 and 20.5 inches tall (39.4 to 52.1 centimeters) and I weigh between 25 and 45 pounds (11.3 to 20.3 kilograms). We have no Brittany Spaniel Breeders listed at this time. 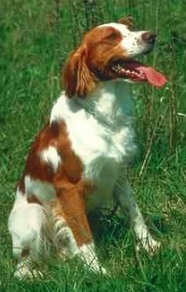 Click here to place your Brittany Spaniel Ad!